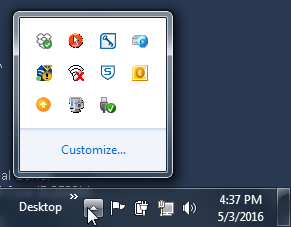 Look for the Sophos icon (a blue and white shield with a capital S) in your system tray. The system tray is the area, normally in the bottom right corner of your computer screen, where Windows keeps information about software running in the background on your computer. Right-click on the Sophos icon and select “Open Sophos Endpoint Security and Control”. A window will popup that has information about Sophos status and options. Near the top left of this window, look for the Status section. You should see that On-access scanning is enabled, 0 items are in Quarantine, and the Last updated date is in the last week or two. If something about the Sophos status does not match up with the description in step 3, please contact ITHelp (email ITHelp in Outlook or call x3462) for assistance. NOTE: Computers not on the City network (such as laptops and other mobile devices), may have different anti-virus software installed. For Windows 7 computers, most likely Microsoft Security Essentials was used. To determine the status for Security Essentials, follow the instructions on this Microsoft webpage.